In January this year, I bought the amazing value Tesco Hudl2 to replace my aging original Nexus 7 as my primary tablet. I bought a purple one, together with a matching purple "Soft Touch" folio case. I've always been a fan of physical keyboards. I can type much faster than I can write - certainly for any sort of prolonged periods - and definitely faster than I can get the words that I want (with or without autocorrect interfering) with a touch keyboard of any sort on a phone or tablet. In particular, a soft keyboard in landscape hides so much of a phone or tablet's screen that it drives me mad. I've tried a number of portable bluetooth keyboards over the years, but have been mostly disappointed. My favourite is still the Freedom, which folds in half, and opens out as more-or-less a full-sized keyboard, but it's a bit of a faff unless you're sitting at a table with some serious typing to do. So with that in mind, this weekend, I spent some Tesco vouchers on a bluetooth keyboard case for my Hudl2. As I've said, I've always liked my Freedom Pro folding bluetooth keyboard, ever since I got it. But, because it folds, it's really only suitable for use when you have a table or other hard surface to stand both the keyboard and your device on. I wanted something that would be a little more versatile and usable in slightly less perfect conditions. b) I could get it to pair, but not to actually work (although the keyboard would pair and work quite happily with my phone). So I put the idea on the back burner for a while. Then this weekend I thought I'd see if I could find out whether anybody else had had problems with the Hudl2 and bluetooth keyboards, and Googled Hudl2 Bluetooth keyboard. I didn't find anyone else who'd had the same problem, but I did discover that Tesco sell a Hudl2 Bluetooth Keyboard case. It's £40, but as with all Hudl2 tablets and accessories, it's eligible for Tesco Clubcard boost. So off I went to my nearest Tesco Extra, armed with £20 worth of Tesco Clubcard vouchers to see what I thought of it. There weren't any on display (out of the packaging), but I figured it was worth a shot without closer inspection at that price. I had some other shopping to do in town, so having handed over my vouchers, I slotted my Hudl into it, and plugged the keyboard into my car charger to get it started; then when I stopped for lunch, out came my Anker wireless charger to give it a bit of a top up so that I could have a play. The first thing to note is that with the best will in the world, you couldn't possibly claim that it's built like a tank. It's actually very lightweight, slightly flexible and rather plasticky. However, for my use, that's actually a bit of a bonus. It means that I can leave the case on the tablet all the time, and continue to use the Hudl2 in my usual preferred portrait orientation with the keyboard switched off and folded back out of the way when I don't need it, without it feeling like it's getting in the way, or that it's adding much more significant weight than my old folio case. That may not sound like much of a recommendation, but it certainly doesn't feel as though it's in danger of snapping any time soon. The outside of the case is only available in black, and has a perfectly pleasant feel. 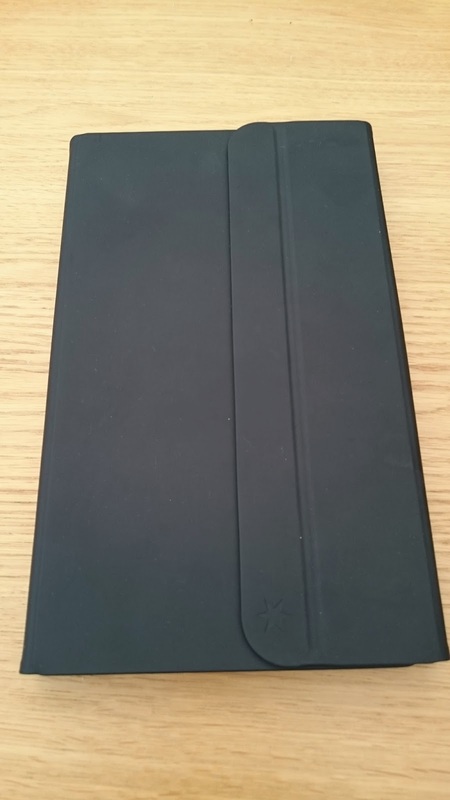 It's not faux leather, but it doesn't feel like shiny plastic, or rubber (which I hate) either - I would guess it's made of the same material as the ordinary colour co-ordinated "Soft touch" case that my Hudl has been living in since I bought it. Inside, the keyboard is stepped, with a raised shelf at the top, containing the on/off switch, and a step down to the keys themselves, plus a couple of raised rubber "stops" in the bottom right and left corners, at the same height as the shelf at top, so that the keys don't scratch the screen of the tablet when the case is closed. You might think that these stops would get in the way and be annoying; all I can tell you is that when I'm touch typing, I simply don't notice that they're there. The closure flap is slim, and uses magnets to hold it closed. It doesn't feel like it's in the way whether the case is closed or folded open but not in use, which is good - I'm not a fan of bulky flaps and closure tabs: they always seem to catch on things. 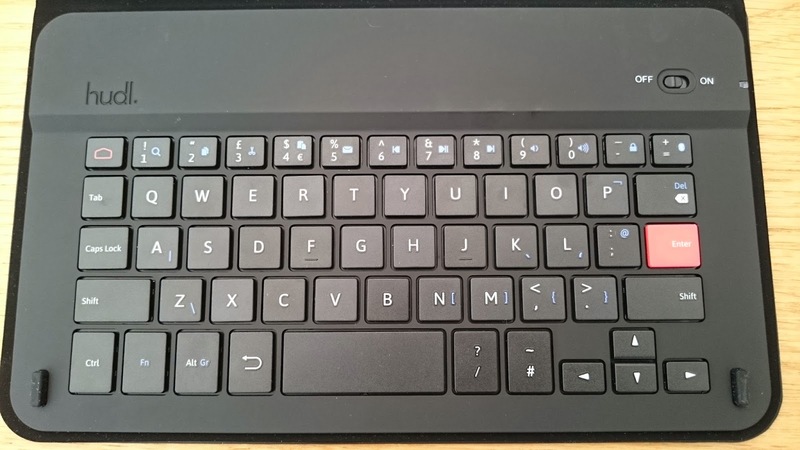 Initial set up is much the same as for any other bluetooth keyboard - put it in pairing mode (as described in the brief instruction leaflet), and search for devices from the Bluetooth settings on the tablet. Once you select the keyboard, you'll be prompted to type a 6 digit code on the keyboard and hit Enter. Job done. Once paired, the keyboard is fairly fast (a second or two, perhaps) to switch on and connect with the tablet, so it's perfectly possible to leave it switched off and tucked behind the tablet most of the time, as mentioned, and then switch it around and turn the keyboard on to type a reply to something when you need to. I'm glad the keyboard came with a brief instruction leaflet though, or I don't think it would have occurred to me to unclip the case from the top of the (landscape) screen before folding it into the usual triangle to form the stand for the screen. There are magnets to hold it in place (the same ones that hold the flap closed), but they're a bit weak. They just about do the job, but you have to be a bit careful to fold them into exactly the right spot. Once everything's in place though, unless your working environment is in a very bumpy moving vehicle, it should stay put. As you might expect from a Hudl product, the keyboard has a UK (not American) layout, with the £ and " keys where you'd expect to find them, above the 3 and 2, respectively. And it does have a separate row of numeric keys, which is definitely good news in my book. My main gripe with the Hudl2's keyboard is the position of the aprostrophe (Fn-L, rather than two keys to the right of the L as on a full-sized keyboard), but with a little practice, I suppose it's not too bad to get used to. And unfortunately, that (or some variation on it) seems to be quite common in portable keyboards. The question mark is on the bottom row, out of position too, but that doesn't seem to bother me as much. It's a little frustrating that there is physically room on the keyboard to have added an extra key or two to the right of the P, L and M without compromising the raised stops on either side of the bottom row of keys, which could have avoided this non-standard layout. On the other hand (see what I did there? ), a very good point in its favour is the presence of a Shift key on both sides of the keyboard. I've tried so many keyboards that only have one on the left, like a soft keyboard, which makes proper touch typing impossible. After a few anomalies whilst typing, I realised that some of the keyboard functionality depends on which Android on-screen keyboard you're using. One of the things that confused me at first was that when using Swype, suggested words still get offered, and using the left and right keys allows you to select one of the options offered ... sometimes! I haven't quite worked out under what circumstances this fails to work (and I'm guessing its not intentional), but it's a bit annoying that it's not entirely predictable. Having said that, you can always touch one of the suggested words on the screen to pick it. Unfortunately, one of the side effects of that is that you can't use the usual Shift-Left/Shift-Right keyboard shortcuts to select characters to be deleted, copied, etc. However, I found that if I switched to the standard Google keyboard, that particular problem went away - largely because so did the word suggestions! - and I could use Shift-Left and Shift-Right to select text as I'd expect. Maybe with different settings, Swype would behave differently too. When I switched to the TouchPal keyboard, things got even more funky, so it seems you get the hardware keyboard sort of overlaid on your screen keyboard of choice, which might make some functionality a bit unpredictable, depending on what provision for hardware keyboards your software keyboard has. Regardless of your choice of soft keyboard, other common keyboard shoftcuts (Ctrl-A, Ctrl-X, Ctrl-C, Ctrl-V) all work as expected, and you can use Alt-Tab to cycle between 8 recent apps. The top (numeric) row of keys also double up as function keys, with symbols for their actions when used with the Fn key. The full set consists of: Search, Copy, Cut, Paste, Email (as you might expect, Android prompts for which app to us when you press it for the first time); audio controls for Prev, Play/Pause, Next, Vol Down, Vol Up; Lock (and unlock) the screen, and Initiate pairing. There's also a Home key in the top left corner, and a Back key to the left of the space bar (with KitKat-style symbols -- not surprising for a keyboard intended for a tablet running KitKat), both of which behave exactly as you would expect on Android. I'm not sure why the manufacturers saw fit to make the Enter key stand out in bright red. I'm sure I'd have managed to find it without the extra "help", and it's a bit unnecessarily garish, but I suppose I can live with it. In summary, I typed this review almost entirely on the Hudl2 keyboard case (except for a few edits just before posting), and although I definitely made a few more mistakes than I would have done on a full sized keyboard, it wasn't bad at all - definitely one of the better miniature ones that I've tried. I may have to investigate whether I can set up a (non-rooted) Tasker task to switch soft keyboards when the hardware one is connected and disconnected though. And from that, you may have gathered that the verdict is that although it's not perfect, I'll be keeping it.